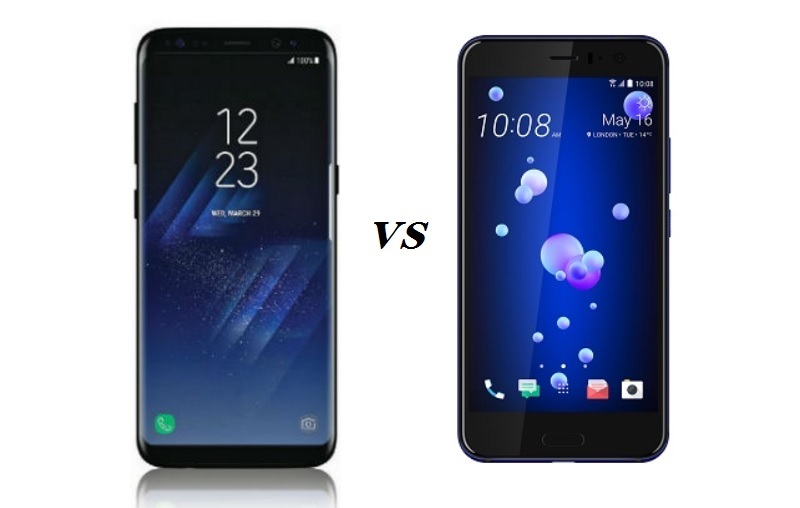 Today, I will be talking about newly launched HTC U11 vs Samsung Galaxy S 8 so, that you could know which one of them is Good for you and I hope this post will also help you to buy the right one for you. So, without any further ado let’s first start having at the Specs, Features, and Design of the HTC U11 and Galaxy S8 one by one. The Samsung Galaxy S8 was the biggest announcement of this year from Samsung, which was launched back in April 2017. The Galaxy S8 is one the most powerful and best-looking device ever made by Samsung. The device packs industry’s best hardware and software which make the device stand out from the crowd. HTC U11, on the other hand, could be another flagship killer of this year launched by HTC. HTC U11 was launched on June 16, 2017. The device features one of the best-looking designs from its earlier generation models, packing the best in class hardware and software on board. I would say that the HTC U11 could be the biggest rival for the recently launched flagship devices like Galaxy S8 and other smartphones available in the market today, and that’s something which made me write this post today. So, Let’s see where the newly launched HTC U11 stands from the crowd. Both theses two devices feature the best designs from their previous generation models. If we talk about the Samsung Galaxy S8, the smartphone features one of the best-looking design Samsung has ever given in a smartphone. As its biggest highlight, the Galaxy S8 features almost a full bezel-less design with no physical home button on the front. No doubt that the phone looks gorgeous with that bezel-less design but that’s something which also makes it a little bit complicated and more touchy when you hold it in your hand. Another big issue with such big bezel-less design is that, if its fell on the ground chances are high that your smartphone screen will get cracked easily because of the fewer bezels on both sides, I will recommend you to buy a good Galaxy S8 cover to protect your smartphone if you buy this. HTC U11, on the other hand, features a metal and glass body with a glossy back which the device even more premium from its previous generation flagship smartphones. And one thing which is good in both these devices is that the curves around the edges that help in handling the phone in your hand easily. The only downside of those glossy back is that they are huge fingerprint magnets so, it will little bit hard to keep the devices smudge-free and looking pristine. Overall, HTC U11 is a very good premium looking smartphone that people would love to hold on their hands. The Galaxy S8 sports a 5.8-inch QHD+ (1440×2960 pixels) Super AMOLED Infinity display with Corning Gorilla Glass 5 on top. I think Galaxy S8 is the clear winner here if we talk about the displays. The Galaxy S8 I think is the only smartphone in the market today that features an edge to edge and top to bottom and super thin bezels. The Quad HD+ Super AMOLED display looks gorgeous with punchy colors, fantastic brightness, and vibrancy. But HTC U11 is not that bad too. It sports a 5.5-inch Quad HD (1440×2560 pixels) Super LCD 5 display with Corning Gorilla Glass 5 on top. The display on the HTC U11 looks really sharp, crisp, and has excellent viewing angles, and vibrant colors. The Samsung Galaxy S8 comes running on Android 7.0 out of the box. It packs a 1.9GHz octa-core Samsung Exynos 8895 processor coupled with 4GB of RAM. The Exynos 8895 processor on the Galaxy S8 is built on a cutting-edge 10nm FinFET process that features a 2nd generation custom CPU core and an advanced GPU for exceptional performance with low power consumption that helps in improving the battery life of your device. The processor embeds a 1Gbps LTE-Advanced modem that supports aggregation of up to five carriers that provides faster and reliable network performance. Talking about the HTC U11, it comes running on Android’s 7.1 out of the box. The HTC U11 is powered by a 2.45GHz octa-core Qualcomm’s latest and most powerful Snapdragon 835 processor coupled with 6GB of RAM. Built with Qualcomm’s advanced 10-nm design, the Qualcomm Snapdragon 835 processor can support phenomenal mobile performance. It is 35% smaller and uses 25% less power than previous designs so that you can get longer battery life, best VR and AR experiences, cutting-edge camera capabilities and Gigabit-Class download speeds on your Galaxy S8 device. Moreover, Similar to the Apple’s 3D touch functionality on the iPhone, this time HTC has introduces a new Edge Sense feature that lets you launch apps like camera and sends texts by simply squeezing the smartphones on the sides. You can also customize the squeeze gesture to any app according to your need. You can also use a “short squeeze” as well as a “squeeze and hold” for more functionality by activating the advanced touch mode. Both the devices feature dedicated fingerprint sensors on the device to lock or unlock the device, but the placement of the fingerprint sensor on the Galaxy S8 little bit disappointing here if compared to the HTC U11. I personally think that the placement of the fingerprint sensor should be on the front below the display just like the HTC U11, which I think is the best place for it and it makes using the fingerprint more convenient than any other place on the smartphone. On the Galaxy S8 you will find the fingerprint sensor awkwardly positioned to the right of the camera which I think is more inconvenient to use than the one which placed on the front below the screen. People will small hand may also find it a little bit hard to use the fingerprint with their single hand. So, for the fingerprint placement, HTC U11 is a clear winner here. But if you find it inconvenient to use the fingerprint on the Galaxy S8 you also have other options to unlock your devices such as facial recognition and iris scanning but I think a fingerprint is more reliable and easy to use. If we talk about the water and dust proofing then yes, both these phones are dust and water resistance, with an IP68 rating for the Galaxy S8 and an IP67 rating for the U11. Flagship devices can’t be complete if it doesn’t have a great Camera and that’s something we find on both of these devices. Both the Galaxy S8 and the HTC U11 features great camera which can capture stunning pictures in both daylight and low light conditions. Both of theses cameras produces great quality images. The Samsung Galaxy S8 packs a 12-megapixel primary camera on the rear and an 8-megapixel front shooter for selfies. On the other hand, HTC U11 features a 12-Ultrapixel primary camera on the rear and a 16-megapixel front shooter for selfies. You can see several images samples shared by Androidauthority where they have taken the sample shots from both smartphone cameras. If you will ask which one is better then I think both the S8 and U11’s cameras are just incredible when it comes to overall image quality but what I can see is that the HTC U11 produces more natural lifelike images here. If you can’t live without a headphone jack on your smartphone then the Galaxy S8 is the only option left for you because it features a 3.5 mm headphone jack and the HTC U11 does not, instead HTC U11 features a 3.5 mm USB Type-C adapter which you can use to listen to the music by plugging your USonic earphones that come along with the HTC U11. The U11 offers a better audio experience with both the external speaker setup and through headphones compared to the Galaxy S8, but in overall quality, you won’t find any big difference in the sound quality on both these devices. According to me, the battery is the most important thing in a smartphone. I mean, no matter what kind of software and hardware your smartphone features, important is how long you are able to use them on your smartphone. I think if your smartphone can’t even last for one day then there is no mean to have such an expensive and software and packed smartphone when you can’t even use them for a full day long. Both theses devices pack a 3,000 mAh batteries where I easily found HTC U11 going through a full day of use. The biggest advantage you will get here with Galaxy S8 is the wireless charging which is not available with the HTC U11. In terms of battery performance, I would say you won’t get much difference between theses two devices except the wireless charging on Galaxy S8. On the Galaxy S8, many have found around 30% capacity left at the end of a day with the normal usage. I think judging theses phones is quite hard as they both are powerful and well-equipped smartphones with latest software and hardware specs, both features killer cameras, gorgeously eye-catching designs and waterproof builds. If you like the bigger screen with the gorgeously looking display with the almost full bezel-less design then I would say you will not find any other smartphone like the Galaxy S8, other than the big full bezel-less design and the wireless charging technology on the Galaxy S8, the HTC U11 could be another great choice for you. That features almost the same specs and features of the Galaxy S8, and price wise HTC U11 also cost about $100 less in the U.S. with less price HTC U11 also features bigger 6GB of RAM and 128GB of internal storage which you can also expand up to 2TB via micro SD card. The HTC U11 has been priced in India at Rs. 51,990, where on the other hand, the Galaxy S8 is selling at a starting price of Rs. 56,999. I hope you have liked the post If you have any questions or want to share something just leave it in the comments section down below. Also, let me know which one you are going to buy and what features you liked the most about these two killer smartphones?